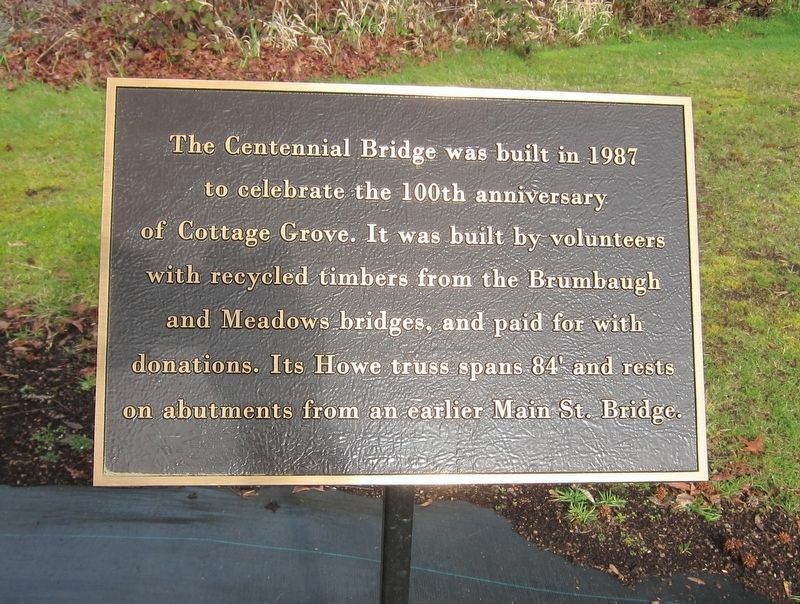 The Centennial Bridge was built in 1987 to celebrate the 100th anniversary of Cottage Grove. It was built by volunteers with recycled timbers from the Brumbaugh and Meadows bridges, and paid for with donations. 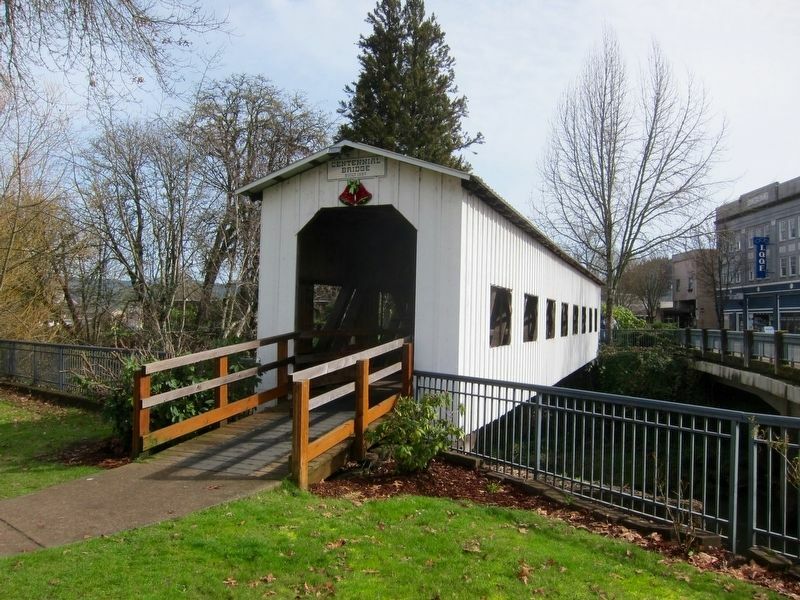 Its Howe truss spans 84' and rests on abutments from an earlier Main St. Bridge. Location. 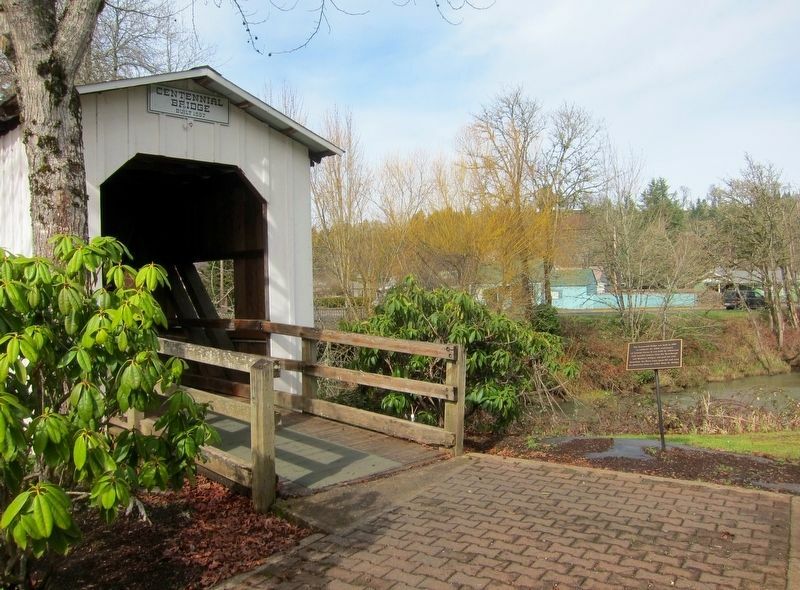 43° 47.843′ N, 123° 3.86′ W. Marker is in Cottage Grove, Oregon, in Lane County. Marker can be reached from the intersection of East Main Street and North River Road. Touch for map. 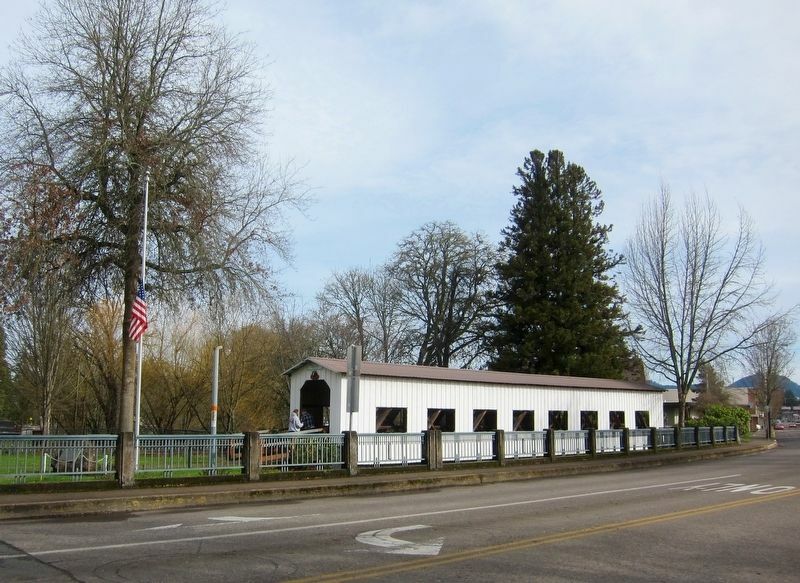 Marker is in this post office area: Cottage Grove OR 97424, United States of America. Touch for directions. The marker is visible here on the right, at the east end of the bridge. (about 700 feet away, measured in a direct line); Elijah Bristow (approx. 13.4 miles away); Bristow Monument (approx. 13.4 miles away). Touch for a list and map of all markers in Cottage Grove. More. Search the internet for The Centennial Bridge. Credits. This page was last revised on November 1, 2016. This page originally submitted on November 1, 2016, by Andrew Ruppenstein of Sacramento, California. This page has been viewed 144 times since then and 2 times this year. Photos: 1, 2, 3, 4. submitted on November 1, 2016, by Andrew Ruppenstein of Sacramento, California.